Google has unveiled the latest version of its Android mobile operating system called Ice Cream Sandwich at the Unpacked 2011 event in Hong Kong. Android 4.0 Ice Cream Sandwich features a new lockscreen and homescreen, with new font and animations, while the user interface (UI) has a close resemblance to Android 3.X Honeycomb. Users can now drag icons on top of another to create a new folder and arrange icons inside it, with the folder itself capable of being dragged to the homescreen dock for easy access. The notification screen is now accessible even from the lockscreen, offers music player controls, and removes items via left/right swipe. Google touts that Ice Cream Sandwich can unlock the screen using face recognition technology. The default Android Web browser now has larger icons for vertical scrolling to open windows, loads mobile versions of websites with an option to revert to the desktop version, syncs bookmarks to Google Chrome on desktops, safe browsing through incognito mode, and saves pages for offline viewing. A new email app allows users to search messages even when offline, whereas the calendar app now offers swipe navigation and multi-touch pinch to zoom gestures. Ice Cream Sandwich also monitors data transfer, measuring data usage and tracking apps that hogged it. The new camera app includes face detection, panorama, auto-focus, dynamic zoom, video recording snapshots, and time-lapse video. A new Android Beam feature moves data between NFC-capable devices with a simple touch. 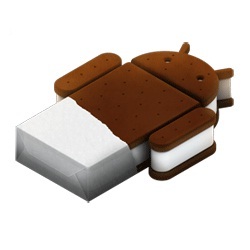 The Android 4.0 Ice Cream Sandwich SDK is available on developer.android.com.